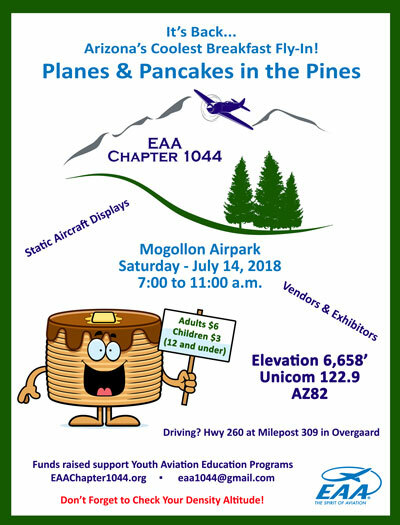 Be sure to make plans to drive or fly in Saturday, July 14, 2018 from 7am to 11am for Planes & Pancakes in the Pines… Arizona’s Coolest Breakfast Fly-in. In addition to the fabulous breakfast fare this fly-in has become known for, there will be numerous vendors and exhibitors. Our chapter will also be signing up kids ages 8-17 for Young Eagle airplane rides to be scheduled at a future date. Mark your calendars! We look forward to seeing you. please click HERE. Once the poster displays, you may right click on the image and choose Save As or Print.